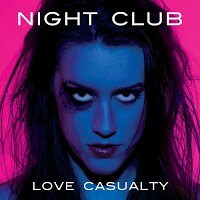 Night Club is unabashedly forward in its basic take on dark, '80s-indebted synth pop, but it's a fun and even goofy ride for five concise tracks. The name Night Club isn't just a name for the dark synth-pop duo of Mark Brooks and Emily Kavanaugh; it's a statement of intent. Once the glo-stick phosphorescence and hairspray resin has faded by the conclusion of their sophomore EP, Love Casualty, it's clear that this is a project with a sole focus on the strobe-lit dancefloors of the 1980s. The music here is replete with bouncy synths and rubbery basslines, all driven home by Kavanaugh's vocals, which are equal parts airy and menacing. But while the quality of the synths is aptly described as "dark," it never veers into horrifying territory; the music here is more Take Me Home Tonight and not so much like early Bret Easton Ellis. The scope of Love Casualty is myopic, but not without good reason. With five songs clocking in at 17 minutes, the EP doesn't have a lot of room to riff on any tangents, and as a result, Brooks and Kavanaugh wisely decide to focus on catchiness above all else, which pays huge dividends. The results of this philosophy include the killer choruses of "Poisonous" and "Precious Thing", the infectious fingersnap/synth interplay of the show-stealer "Give Yourself Up", and the Katy Perry lyrical style of "Strobe Light" ("Your love is like a strobe light/You turn it on, and you turn it off"). It's an eminently goofy project -- Brooks' background as a director for Metalocalypse no doubt played a role in that respect -- but it's also an enormously fun, no-frills affair that's very aware of its limitations. Night Club keep things simple and straightforward without sacrificing memorability; these are monster hooks that are designed to invade brains and stay inside for a long time.